Many of us are certain that human eyes are at the evolutionary apex of animal vision. While we have rather good general purpose vision – able to see a speck of dust on the window, provide a full experience of color space, sense motion so quick that we can (some of us) successfully hit an approaching fastball out into the bleachers, visualize a world lit with brilliant sunshine or dim starlight, move rapidly from an interesting object to another one far from it, and capture all the information in a scene – other animals badly outperform us in every one of these abilities, and many in several of them – with each of their eyes at the same time. New imaging technologies and high-speed computers make it possible to enter the visual worlds of species who see things very differently from the way we do. This talk will discuss the visual capacities of other species, ranging from deep-sea shrimp ,who have no optics in their eyes yet see the hot water emerging from hydrothermal vents, to the many creatures that see ultraviolet light or image polarization patterns such as those a potential mate flashes when courting. Much of the talk will be devoted to the astonishing eyes of the mantis shrimps. These creatures have two independently moving eyes that can see color both in the range of light that we experience and in the ultraviolet. They can also visualize two different kinds of polarized light, and either eye by itself can measure distance. The talk will employ a variety of imaging techniques to illustrate in a way we humans can see, if only crudely, the visual worlds inhabited by other animals. Tom Cronin studies the visual physiology of invertebrates, especially marine and estuarine crustaceans. His research group’s motto is “If it has eyes, we can study it!” In recent years, his group has published papers on vision in squids, butterflies, fiddler crabs, cuttlefish, primates, dolphins, orioles, reef fishes, sponges, right whales, poison-dart frogs, fireflies, octopus, deep-sea crabs, whooping cranes, and mantis shrimp. Most of Tom’s recent work has been with the mantis shrimps (stomatopods), a unique group of tropical crustaceans that have extremely complicated behavior and perhaps the most unusual eyes ever evolved. In particular, he has been studying their color vision systems (which have many as 16 spectral channels), their photic environments, their systems of color communication, the dynamics of their photoreceptor cells, and their ocular movements and control systems. He and his research group also have begun studying molecular genetics of mantis shrimp opsins, the photoreceptor proteins that underlie the visual detection of light in these organisms. The goal of this research is to learn how the photoreceptors evolved and how these visual proteins are specialized for color vision and for seeing the polarized-light signals that many species of mantis shrimps produce. Tom has published numerous papers on his research on the visual systems of animals ranging from sponges to humans, with the main corpus of his publications focusing on marine invertebrates. He also is co-author of the authoritative text Visual Ecology. Among other honors, Tom is an elected Fellow of the AAAS and of the International Society for Neuroethology. Tom earned a PhD at Duke University and then did postdoctoral work with Timothy Goldsmith at Yale University before joining the faculty at UMBC. President Larry Millstein called the 2368th meeting of the Society to order at 8:05 p.m. He announced the order of business and welcomed new members. The minutes of the previous meeting were read and approved. President Millstein presented a summary of the 30th meeting of the Society, held in 1872. President Millstein then introduced the speaker for the evening, Thomas W. Cronin, Professor of Biological Sciences, University of Maryland Baltimore County. His lecture was titled “Seeing the Light: The Wonderful Diversity of Light Perception in Living Organisms”. Dr. Cronin began by asking how we can presume to know what other animals see. He explained that we every animal with even a simple visual system uses the same visual protein called opsin to make vision possible. All animals with visual systems can trace them back to a common Precambrian ancestor that evolved opsin, so our eyes share the same basic chemistry with other animals. Similarly, all eyes are based on the same physics and optics. Thus, we can gain very good insight into the perception available to other animals by looking at the structure of their retinas and the molecules found there. Dr. Cronin illustrated this analysis through a series of examples tracing the evolution of eyes. He first introduced a single-celled photoreceptor in the skin of a squid, which has no directional discrimination, but does take in light and inform behavior, in this case the behavior of a pigment cell. A slightly more complex example is a the fan worm, which has patches of photoreceptors that show useful changes in light intensity, even if they don’t image any discrete object. Further along are “eye cups” that place the photoreceptors in a recess, which provides directionality, and “pinhole eyes” such as those found on the nautilus, which provide remarkably good vision without involving any complex optics. From the basic proto-eye design of eye-cups, eye design evolves naturally in two divergent directions. Covering the eye-cup over with a lens substantially improves the discrimination of the photoreceptors, creating a simple eye such as that in humans. Alternatively, compound eyes simply multiply the number of eyecups to provide directionality, such as those found in flies. Dr. Cronin them turned from the physical structure of the eye to the different spectral, polarization, and spatial perceptions available to animals based on their eye structure and chemistry. Dr. Cronin cited the difference between the placement of eyes on predator versus prey animals, but also emphasized that the cells within their respective retinas are configured differently, too. A cat, for example, has forward-set eyes providing 98 degrees of binocular vision and 180 degrees of total vision, with a correspondingly large blind spots. Rabbits, on the other hand, have eyes placed to the side of their heads, providing more than 330 degrees of total vision, at the cost of only 24 degrees of binocular vision. The cells within their retinas are optimized for this eye position, providing either very high resolution around the point of focus for seeking out potential targets, or, in the case of prey animals, a wide horizontal band of high resolution along the horizon, where predators are likely to appear. The spectral capabilities of animals were first investigated in an ingenious study by Sir John Lubbock, who noticed that ants tend to move their larvae into dark places and used this behavior to test their perception of light. He used a prism to split sunlight, and then placed ant larvae on each color band. The ants responded to each color of light, moving the larvae into darkness, but seemed most agitated when the light was placed in the apparent darkness beyond the violet edge of the spectrum. Sir Lubbock correctly surmised that ants were capable of UV vision, which confirmed for the first time that animals could see parts of the spectrum that we have no sensation of. UV vision is not unique to ants, or even particularly rare: fish, amphibians, reptiles, birds, insects, other mammals, even mollusks have ultraviolet cone cells. Dr. Cronin explained the extraordinary vision systems of the mantis shrimp, which has the most complex eyes that we know of in regard to color sampling, with at least 10 spectral classes of receptors in the visible and at least 5 in the UV band. Its compound eyes move independently, providing up to six views of an object at once. Polarization is another facet of vision, and another one that we have no ability to see. Strongly polarized light is generated by natural conditions such as atmospheric scattering and reflection off of water. Animals with sensitivity to polarized light can use it to navigate and to locate water sources, as well as to signal one another. The mantis shrimp (of course) can see polarized light, even complex circular polarization, and use it both for threat displays as well as for courting. Dr. Cronin concluded by explaining that eyes exist in many forms and shapes, and each one is specialized for a specific environment to sample space, color, and other properties of light that together provide a sophisticated understanding of an animal's environment. One questioner asked about perception of time, which is an element of the perception of motion. Dr. Cronin responded that vertebrates have ganglion cells behind the photoreceptors in the retina, which respond preferentially to patterns of light on the photoreceptors that correspond to different directions of movement. Another speaker asked what maximum range of usable "visual" wavelengths is. 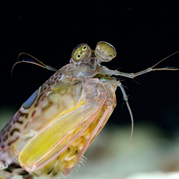 Dr. Cronin noted that human red receptor sensitivity up to 700 nanometers is about as long as any animal's, but we are narrowly beat out by a few nanometers by mantis shrimp, who are beaten by goldfish. Mantis shrimp by far use the shortest and most energetic wavelengths, down to the photodestructive 310 nanometer UV band, which they filter to avoid harm. After the question and answer period, President Millstein thanked the speaker, made the usual housekeeping announcements, and invited guests to join the Society. At 9:55 p.m., President Millstein adjourned the 2368th meeting of the Society to the social hour.